Been a while we shared something about Online cash, there're many of them I will be posting soon, PayPal, Adsense, etc, and how you can legitimately earn and handle your money and transactions with them, meanwhile today we'll be talking about one of the World's biggest e-commerce business, Paypal. There is a simple question only a few think about, not to even speak of searching around for answers. "Can I Get a Paper Check From Paypal?" The Answer is: "Yes, You can Receive your Funds as Check from PayPal." There are various reasons why people request their funds to be sent to them via Check from PayPal. The major ones are perhaps, they have issues with PayPal or the Bank account they Linked to their Paypal, hence want it deposited to another bank where they run an account, so a paper check is the best way to do it. Whatever your reasons are, you can ask PayPal to push all your funds as Check and send it to your doorstep. You'll need a verified account to choose the paper check option, which also requires a confirmed address. 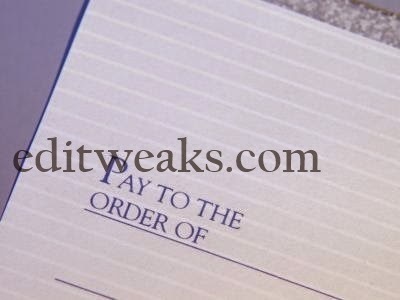 It takes one to two weeks to receive the check for U.S. addresses and six weeks for foreign addresses, making a paper check the least-convenient method to withdraw funds right?. Note that PayPal charges $1.50 for the check, while the other two methods are free. Click on "Withdraw." >> Choose "Request a check." Fill in the amount you wish to withdraw. Use a decimal place between the dollars and cents. Use the pull-down menu to choose where you want PayPal to mail the check. You can add a new address if necessary by following the links. Click "Continue." In case you ant to still change the Amount you want them to send you, click "Cancel," then go back to Step 4. A $1.50 check fee will be subtracted from the proceeds. Click "Submit." Go to you mail box for a confirmation email. If you do not receive this, log back into PayPal and check the "My Account" section to be certain your check request has been processed. PayPal will issue the check in the name of the account holder, so you will not be able to send a PayPal check to someone else. Sending a check to someone else's address requires you to provide the recipient's credit card number to add the mailing address to your PayPal account. It is always Adviced, even by other companies and Payment processors to use Bank Wire Transfer or The PayPal debit card (ATM or foreign currency transaction fees may apply.) which can be used to withdraw your funds anywhere in the world as it is faster, safer, and free.